The National Basketball Association has apologised to former player Magic Johnson after Los Angeles Clippers owner Donald Sterling called him a bad role model for contracting HIV. Sterling, speaking on CNN following racist remarks made in April, said of former LA Lakers star Johnson: "He should be ashamed of himself." The NBA has condemned Sterling's "malicious and personal attack". Sterling, 80, was banned for life by the NBA last month and fined £1.5m. That followed the revelation that he asking a woman not to associate in public with black people or bring them to games. Monday's interview with CNN's Anderson Cooper was the first time Sterling had spoken in detail since the racism story emerged, and he criticised Johnson's lifestyle, saying: "He acts so holy. He does nothing. It's all talk." Johnson, who is scheduled to appear on Cooper's show on Tuesday, said on Twitter: "I'd rather be talking about these great NBA Playoffs than Donald Sterling's interview." The 54-year-old, who won five NBA titles with the Lakers in the 1980s, added: "After this week, no more Sterling talk." NBA commissioner, Adam Silver, responded: "I just read a transcript of Donald Sterling's interview with Anderson Cooper and while Magic Johnson doesn't need me to, I feel compelled on behalf of the NBA family to apologise to him that he continues to be dragged into this situation and be degraded by such a malicious and personal attack. 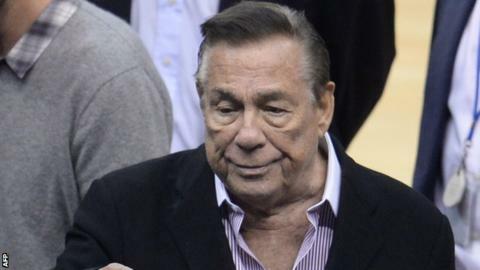 "The NBA Board of Governors is continuing with its process to remove Mr Sterling as expeditiously as possible." The controversy has come as the Clippers have their best opportunity in years to fashion a deep play-off run. They are tied 2-2 in their best-of-seven Western Conference semi-final series against Oklahoma City.